Our local quilt guild (Dalemead Quilt Guild) makes quilts throughout the year for a few local organizations. Members of the quilt guild are encouraged to make quilts at home, often with fabric donated to the guild, and bring them completed to add to our collection that is usually distributed in May and June. 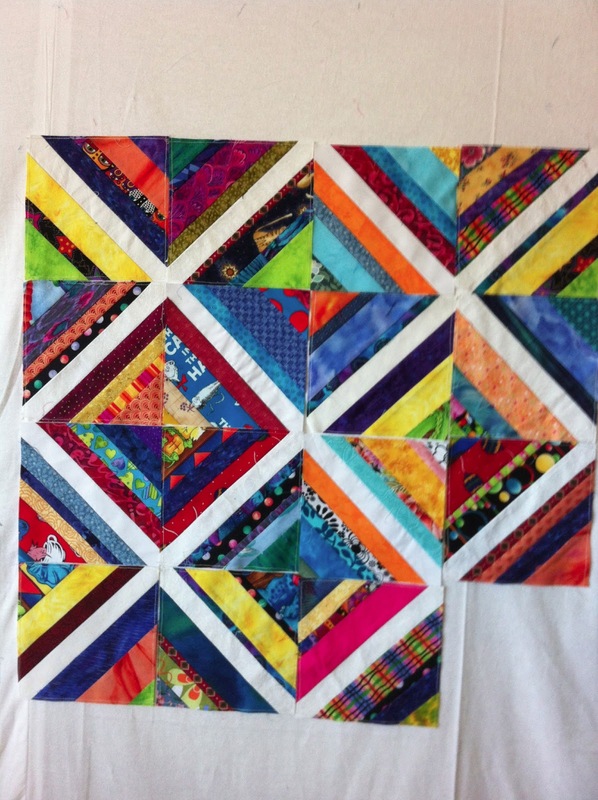 This year we have also been collecting scrap quilt blocks for making a couple group quilts. One of the patterns is the double four-patch. The pattern is from MaryQuilts.com and is found here. 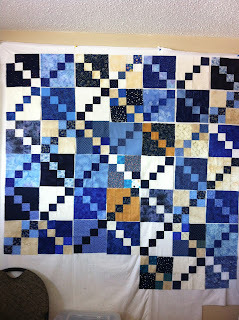 This is such an easy quilt block to make and the light and dark chains really stand out when the blocks are put up on the design wall. 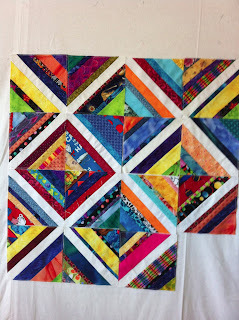 The second quilt block we've been working on is a scrappy string block. The block is made starting with a white strip of fabric, 1.5" wide and about 11" long. Bright colored strips of fabric of varying widths are added to each side until a 6.5" square can be cut from it with the white strip in the center on the diagonal. Our annual "Stone Soup" Day will be April 13, 2013 and anywhere from 20-30 quilters will gather, throw together the resources they have and cut and sew and quilt all day. We hope to have more than 40 quilts ready for donation by the end of our Stone Soup Day. The Strathmore Storefront school is an alternative schooling option for young people who don't thrive in a regular school setting. For many of these kids, graduating is a huge accomplishment. Quilts are donated and gifted to every graduating student and for the young moms in the program, baby quilts for their babies are also donated. The storefront school is part of the Golden Hills School Division. Do you have a favorite organization to donate to?